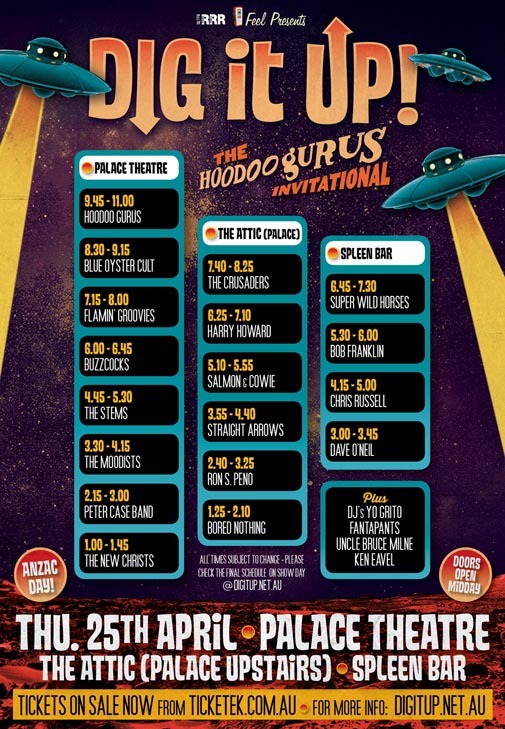 20+ acts, all handpicked by the Hoodoo Gurus performing across three venues and four stages all within five minutes walk of each other in central city Melbourne. Take advantage of all days pass outs, a street full of quality food and restricted capacity. With all events held indoors there is no fear of sunburn here! Are there any reserved seats? No. Dig it Up! Melbourne is entirely a GA event. No. This is an over-18’s event only. Is there an entrance point for Dig It Up! Before entering any of the Dig it Up! venues everyone must first exchange their ticket for a wristband. This exchange will happen at the Palace Theatre box office from 12.00pm on show day. Once the wristband has been secured patrons are free to visit any of three venues. Flamin’ Groovies, Blue Oyster Cult, Buzzcocks, Peter Case Band, The Stems and loads more to be announced – plus Hoodoo Gurus performing Mars Needs Guitars (plus other hits) live and in it’s entirety. No. Sorry. Tickets are to be exchanged for wristbands. This is necessary for crowd control. Wristband exchange will be available from one hour prior to the first acts performance. Doors open at 12.00pm and bands start from 1.00pm. Set times will be posted shortly. Crossover between acts is minimal. The expected ebb and flow of the day should make it possible for anyone to see all acts. Yes. Your wristband allows you to enter and leave the venue at any time throughout the day, however pass outs will close from 8.00pm when everyone is encouraged to come back inside the Palace Theatre to see the headline acts. Is there anywhere to eat? Bourke St. is full of interesting places to eat. Make the most of it! There will not be any food stalls. Where is the Palace second stage? Upstairs – 3rd floor of the Palace. Where are the other venues? The other venues will be announced shortly.